If you have taken the plunge and decided to splash out on a weekend in Rome this Valentine’s Day then this is The Rogue’s top list of things to do while here for your romantic getaway. Be warned: this is not your usual list, there are some slightly off-beat ‘romantic’ suggestions! Alas, you cannot wander right inside the Lupercal Cave today. It was only rediscovered in 2007, much to the excitement of archaeologists and is still buried deep beneath the Palatine Hill. You can, however, head down to the Roman Forum and imagine what the scene must have been like 2,000 years ago, as the Romans celebrated “Lupercalia”, the ancient precursor to our modern Valentine’s day. It was definitely a more raunchy festival for the Romans; if you’d been passing by back then you’d have witnessed naked guys with whips dashing through the Forum slapping passing girls on their backsides! Just don’t be tempted to recreate the ancient festival yourself, as the local authorities probably aren’t as liberal as they were in the ancient world. If you’re struggling with your imagination then join our Private tours of the Colosseum and Roman Forum and our guides will bring it all to life for you by telling you this and even more riskué stories of what happened here in the heart of ancient Rome. If you want to stay true to the roots of Valentine’s Day then it’s worth heading over to the church of Santa Maria in Cosmedin, where the skull of St. Valentine rests today - okay it’s a bit of a macabre Valentine’s activity, but we are The Rogue Historians! The church itself is worth a visit alone for its beautiful medieval religious architecture and stunning Cosmatesque marble floor. You can pay homage to St. Valentine in a small chapel on the left of the church, where his skull can be found wearing a floral crown sitting in a reliquary. Besides the more obvious Valentine’s connection there is the chance to check out the “Bocca della Verita”. This Medieval curiosity actually dates back to the ancient world and was likely to be a sewer cap cover of sorts, with his grotesque face representing a local river deity, Oceanus. It was later recycled by the Medieval Romans and used as a kind of honesty trial: those who told a lie with their hand in the mouth of the beast would have their hand snapped off! The legend may date to the Middle Ages, but was popularised in the modern imagination by the iconic film of the Dolce Vita era, “Roman Holiday”, when Gregory Peck’s character tricked Audrey Hepburn by using the ancient Roman legend. Little known fact: Gregory Peck went off script in this scene and Audrey Hepburn’s reaction of horror was 100% genuine! Alas, today this part of the church has become a bit of a tourist trap - with scores of tourists lining up eager to recreate their ‘Roman Holiday’ moment, a 2€ fee for the privilege, and a very strict one photo policy. This particular stop is a hard pass for us, but you can always peak at it through the railings on your way out of the church. But if its an absolute must we can happily accomodate your Roman holiday fancies on our 'Best of Rome Private Tour'. You may have heard of the tradition of lover’s attaching small padlocks to the railings of bridges or gates to symbolise the strength of their love. The more modern take on this tradition actually took off in Rome at Ponte Milvio in the early 2000s after the publication of the immensely popular Italian novel “I want you” ( Ho Voglia di Te) by Federico Moccia. It’s a well-chosen spot, given that it’s close to where St. Valentine was originally buried in the 3rd century CE. The Ponte Milvio might be a bit off the beaten track for some tourist itineraries - it’s located in the north of the city away from most of the more major tourist attractions but is worth trek if you want to check out the lesser visited sites of the Foro Italico Olympic complex and the fantastic MAXXI modern art museum designed by Zaha Hadid. This next spot is close to The Rogue Historians’ heart. The original ‘Rogues’ had their first date on this, the tallest of Rome’s hills and some of our friends have even popped the question here. 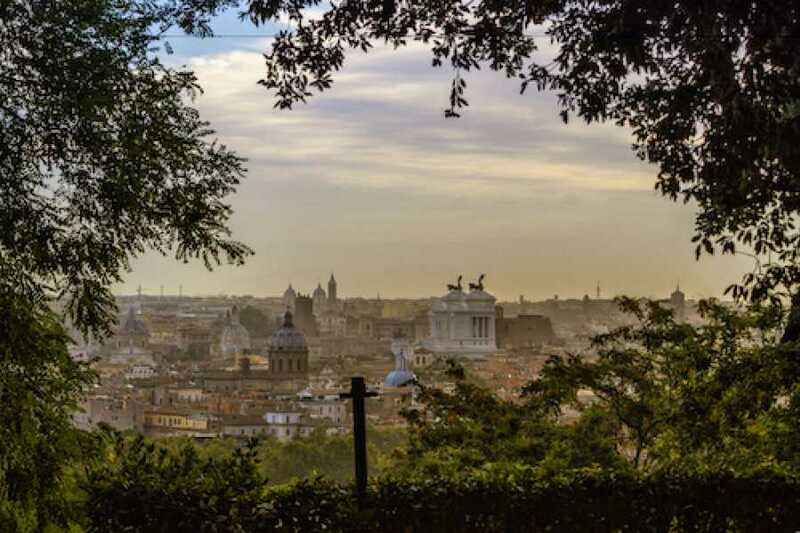 Yes, it’s a bit of a cliche ‘romantic’ spot amongst the locals and it’s not exactly off the beaten track even for tourists, but it’s well known for a good reason: the view over the Eternal City is simply spectacular. During the day you can wander through the gardens on the hill and try to pick out the city’s most famous landmarks on the horizon, before checking out the daily firing of the cannon - which has been fired every day at midday since 1904, with a brief interruption during WWII. The Rogues can attest to the accuracy and power of the Gianicolo’s cannon: we used to live in the neighborhood directly below it and the windows of our apartment would rattle every day at 12:00! If a trip to Rome isn’t enough of a Valentine’s gift and you still feel you’ve just got to splash out and do the whole flowers and chocolate thing, then the Rogues have you covered. For flowers you should head to Campo dei Fiori - today it’s best known for being a fruit and vegetable market, but there are still a few kiosks at the end of the piazza selling seasonal bouquets that attest to the square’s original use as a ‘field of flowers’. If chocolates are more your thing then make a beeline to ‘Confetteria Moriondo e Gargilio’. These charming chocolatiers have been making chocolates and other sweet treats since the 19th century, and they were the official confectioners to the Royal House of Savoy back in the day. they moved to Rome from Turin after the reunification of Italy in the 19th century and set up a gorgeous little jewel of a shop that looks like a traditional tea room. But don’t take our word for it; the famous Roman poet Trilussa loved their sweet treats so much he felt compelled to immortalise it in verse! So there you go, a few suggestions from the Rogues. And if you find yourself alone then don't worry just join one of our group tours and you are sure to meet like-minded people, plus whats better than self-development through education anyway?